Negotiators at the Paris summit aim to wrap up a global agreement to curb climate change on Saturday - a day later than expected. "We are nearly there. I'm optimistic," said French Foreign Minister Laurent Fabius, who is chairing the summit. Efforts to forge a deal faltered on Friday, forcing the talks to overrun. UN Secretary General Ban Ki-moon said the negotiations were the "most complicated, most difficult, but, most important for humanity". Mr Fabius told reporters in Paris that he would present a new version of the draft text on Saturday morning at 0800 GMT, which he was "sure" would be approved and "a big step forward for humanity as a whole". "We are almost at the end of the road and I am optimistic," he added. The summit is entering a final push to try to secure a global agreement that would stake out a long-term strategy for dealing with climate change. However, there are still some unresolved issues. Differentiation: Related to the finance problem is how do we "differentiate" between developed countries, who can afford to donate money, and developing countries who need support? Richer nations want emerging economies to take on more of the burden of cutting emissions, and providing finance to the very poor nations hit by the impacts of higher temperatures. Overall goal: What is the overall target? Should nations try to limit global rises in temperature to 2C or 1.5C or by "well below 2C" - above what they were in pre-industrial times? The global average temperature has already risen by roughly 1C. A deal signed in Paris would come into force in 2020. Participants at COP21 - as the UN conference is called - have been working on the precise wording of the landmark document since Wednesday. 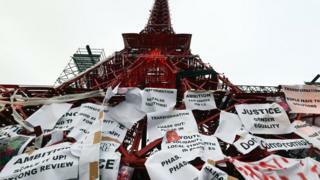 Analysts say a delay in the Paris climate talks is not surprising, given that negotiators are trying for a deal that will lead to long-term changes in the global economy. "This needs consensus," said Michael Jacobs, an economist with the New Climate Economy project. "There's a lot of negotiating to do." Meanwhile, Brazil has announced it has joined the "high ambition coalition" - which is a group of developed and developing countries jointly pushing for an ambitious accord in Paris to curb global warming. Countries in this newly-formed coalition, which include the US, want a tough overall goal, mentioning a temperature-rise limit of 1.5C in the agreement text, and a strict system for assessing whether countries stick to - and increase - their pledges. Earlier, Jennifer Morgan, global director of the Climate Program at the World Resources Institute, said overnight negotiations had made progress. "I'm still cautiously optimistic," she told BBC News. "But every country just has to go further. They have to reach to the extreme of what they can do here - it's all still within reach." On Thursday, France presented the latest draft version. At 27 pages long, it was considerably shorter than previous versions. It says that temperature rise must be kept "well below 2C above pre-industrial levels and to pursue efforts to limit the temperature increase to 1.5C". COP 21 - the 21st session of the Conference of the Parties - sees more than 190 nations gather in Paris to discuss a possible new global agreement on climate change, aimed at reducing greenhouse gas emissions to avoid the threat of dangerous warming due to human activities. It had been hoped a deal could be reached on Friday but organisers said they wanted to give delegates more time for consultations. "The really tough issues in the negotiation are still very much sitting there," warned New Zealand's Climate Change Ambassador, Jo Tyndall. However, some campaigners were not happy with Thursday's draft, saying it denied "climate justice". "Rich countries have a responsibility to ensure a fair global deal for everyone, not just themselves, and as we move into these final hours of negotiations poorer countries must not settle for anything less," said Adriano Campolina, from ActionAid. But Helen Szoke from Oxfam called it an "encouraging development". "The draft has affirmed the need to set quantified funding goals for both climate change mitigation and adaptation for the years after 2020," she said. Do have a question about the climate change negotiations or about the potential deal? Email haveyoursay@bbc.co.uk with your questions. Video COP21: What happens if climate conference fails? Video Test yourself: Aosis or Alba?